The 6.5” White Polishing Pad is a flat pad intended for fine polishes and pre-wax cleaners. It has very little cutting power so it will not abrade your vehicle’s paint. 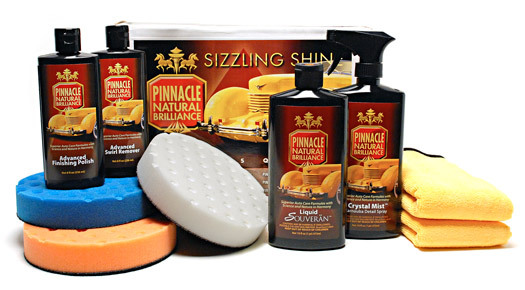 Use this pad with Pinnacle Advanced Finishing Polish to remove light blemishes and restore gloss. You may also use this pad for wax or sealant application. Polishing tip: When polishing your vehicle, always work in 2’ square sections. Set your dual action polisher between 4 and 4.5 RPMs. Work in overlapping figure eight patterns until the polish starts to dry. Buff away haze and check your results. Repeat if necessary. Clean pad with a Duo-Spur Foam Pad Cleaning Tool periodically to keep the foam from becoming caked with polish. Always apply a wax or sealant after polishing. When tiny lines show up in your vehicle’s paint, you can do something about it. The Pinnacle Complete Swirl Remover Kit equips you with the best polishes and pads to tackle a wide range of surface problems. Your paint will look and feel like new!